Panther has green eyes and also has a curly tail. 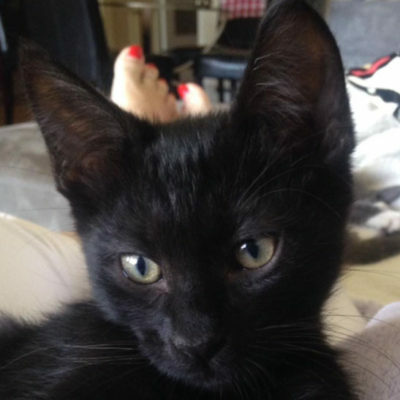 Super attached to his siblings, playful and very cuddly. 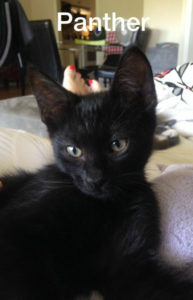 Loves to play hard with his brother (Panther) and then look for human love and kisses. 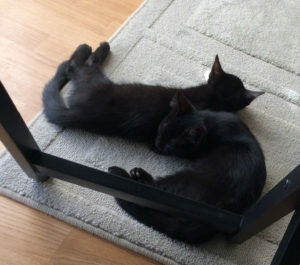 Note: Linxy and Panther— these two boys are super attached litter mates. I Can imagine the amount they have been through together in their short lives. They eat and sleep together and have a certain call for the other if they can’t find each other in the house. It would be great if they can be adopted together. Linxy can be shy with people, but Panther is much more social. If Panther goes to a human, Linxy will follow in short order but not go on his own. Very sweet and loving kittens.